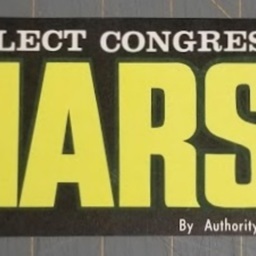 Undated bumper sticker promoting the reelection of US Congressman John O. Marsh Jr. It was issued authority of Leo Snarr, manager. "Re-Elect Congressman Marsh" Bumper Sticker, undated, M.L. Bauserman Collection, Truban Archives, Shenandoah County Libary, Edinburg, Virginia. Unknown, “Re-Elect Congressman Marsh Bumper Sticker,” Shenandoah County Library Archives, accessed April 25, 2019, http://archives.countylib.org/items/show/12405.